Blooming in color this sweet delight of a bouquet is pleasantly tucked and arranged in a 4″ square, clear glass vase. 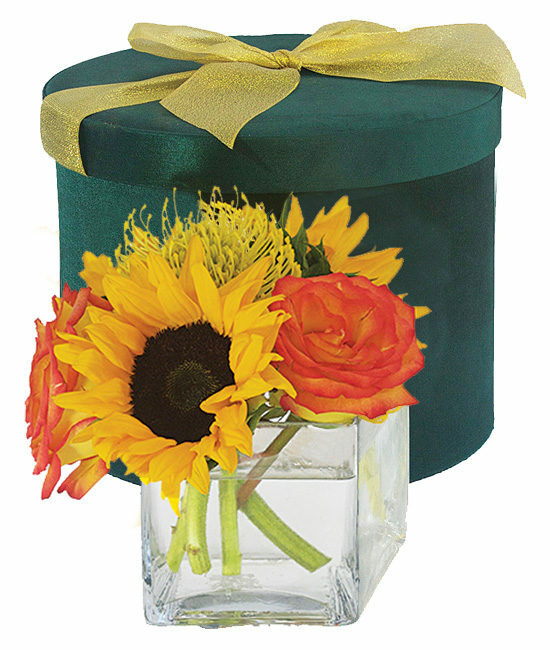 To complete the presentation it arrives in our garden green satin hatbox with gold bow. Remove all foliage that will fall below the water line. Remove the “guard petal” on each rose – this is the outermost petal left on to protect the bud during shipment. You may also remove any petals that may have slightly bruised during shipping. We recommend cutting all stems underwater for best blooming results. Cut flower stem to complement vase size, this will vary. Always add fresh water daily. Trim away spent blossoms as your bouquet ages and rearrange if necessary.